Imagine if airport desk agents had to work without a computer system, taking customer information by hand and physically shuttling updates between different departments. This is unimaginable for a reason – the global aviation system would grind to a halt – yet there is still one aspect of air travel that relies almost exclusively on manual and offline processes: the re-accommodation of passengers stranded due to irregular operations (IROP), which requires re-ticketing, generating vouchers and booking hotels. Re-accommodating passengers manually should be unimaginable as well, but it isn’t… yet. For passengers, the total cost of IROP is not only disruptive but personal as well. If you peruse travel discussion forums, IROP is a frequent and frustrating topic of discussion among travelers. 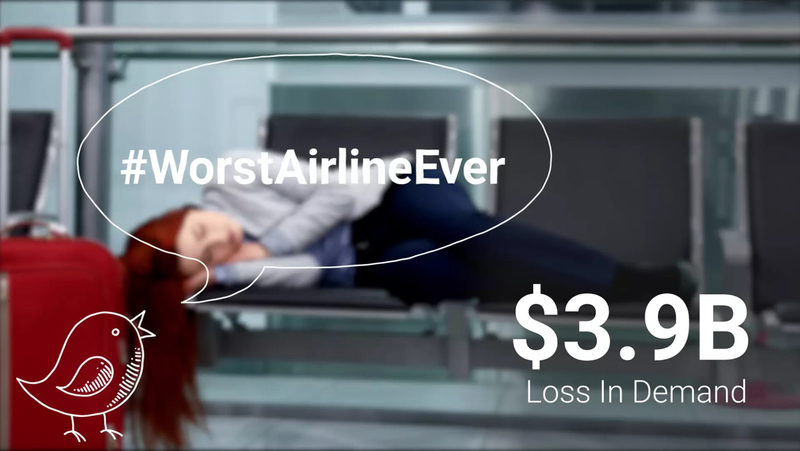 Of course, “IROP” is an industry term – travelers know it as “cancelled flights,” “ruined vacations,” “frustrating delays,” “tired and hungry kids,” “lack of information” …and often passengers take to social media to vent. If IROP was a souvenir t-shirt, it would read: My preferred airline cancelled my flight, then I waited hours in line, and all I got was this lousy voucher. Why should airlines replace the current, manual process with a better, digital process for IROP? In an increasingly cashless, mobile society nobody wants to carry around paper money, let alone a voucher that basically serves as an “IOU” for hotels and restaurants. Vouchers must be approved, printed and distributed to hundreds of passengers. In an age of mobile boarding and biometric verification, this process is inefficient and frustrating for both passengers and desk agents. Passengers only get a voucher after waiting in long lines for an airline kiosk or after waiting on hold for hours to speak to a customer service representative. This is demoralizing for those who travel frequently and for business, not to mention parents traveling with children. Vouchers are inefficient for airlines as well, as they do not help leverage better pricing and more profitable agreements with the hotels. Vouchers are stuffed away in passengers’ pockets and forgotten about. Today’s passengers spend every waking moment on their mobile devices, looking for information, engaging businesses and spending money – not in their pockets looking for paper vouchers. Voucher uses are limited; they don’t allow passengers and loyalty program members to upgrade their hotel room or purchase other ancillary products and services. Switchfly gets it. We understand the technological limitations that airlines struggle with and the complexities of making unexpected and swift arrangements due to flight cancellations, especially when coordinating with another industry (hotel). And we’re set out to change this paradigm. Switchfly’s Airline IROP Management transforms irregular operations management from a costly liability into an opportunity to earn customer trust, satisfaction and loyalty. Instead of a voucher and the long lines, waits, calls and drawn-out process that go with it, Switchfly has re-engineered the process so airlines can take a passenger-centric, mobile approach to IROP management. By connecting directly with the airline’s PSS to read PNR data, the Switchfly solution alerts passengers when a flight is cancelled and needs re-accommodation. Passengers receive a notification via text or email directly from their airline to select a hotel to stay at until their flight. In other words, no more standing around waiting for information! Passengers can view available hotel rooms and select the room of their choice without ever seeing the price or having to approach the airline’s kiosk. Switchfly provides the technology to make these connections, but the customer experience is brand-matched with the airline for a seamless experience: your brand, our platform. What are the benefits of modernizing the IROP process for a digital world? Communication: Passengers get immediate notification and information that their flight has been cancelled. No more waiting around trying to snag the next available desk agent who is frantically trying to satisfy other customers, calling customer service or waiting for the airline kiosk. Everything is taken care of right from their smartphones so they can select a hotel and get a good night’s rest. Compensation: Control is returned back to the customer. The passenger selects their hotel room, and can use loyalty points to upgrade or purchase additional ancillary products and services. No more feeling like they are begging and haggling with desk agents. Choice: Airlines save up to 50% on the cost of a hotel room by leveraging Switchfly’s global network of more than 410,000 unique and verified hotel properties, and save more than 25% in overhead requirements to manage disruption crises. And airlines can up-sell and cross-sell passengers through Switchfly’s robust supplier network of activity, air, car, hotel and insurance products. Control: Airlines add new and higher ancillary revenues as they integrate loyalty membership into the IROP process. They also strengthen and add value to a direct (mobile) channel to communicate with and engage customers. Switchfly is focused on improving bottom-line results for airlines as well as the passenger experience. Vouchers are outdated and inefficient, but the fact that they are still in use only reflects the real challenges airlines face – limited and disparate technology, poor systems integration, legacy business processes and lack of direct channel communication with customers. Airline IROP Management by Switchfly gives airlines a platform to turn IROP into a digital business process that is completely brand-matched and integrated with existing systems, and that fundamentally changes one of the most frustrating and problematic areas of passenger experience. Let Switchfly help you go “voucherless” once and for all, streamline the re-accommodation process, improve the passenger experience, leverage passengers’ mobile devices and drive higher revenues through ancillary selling with Airline IROP Management. The Switchfly team will be in Barcelona for World Passenger Symposium, October 24-27. We hope to see you there, and be sure to download and share our infographic here on the hard and soft costs of IROP, as well as our video here.